CPU generates heat when the computer is in use, as the processor carries out the instructions of operating system and computer program to perform the intended function. And it’s not just CPU which generates heat, but most other components inside the casing of a computer too, especially GPU (graphics processing unit or video adapter) and hard disk. The heat is generated by electronic component because electric used to process instructions meets electrical resistance when running through millions of transistors and conductors in the IC, which measurable by using Joule’s laws. Excessive heat leads to extreme hot and high temperature, which can potentially damage and burn the electronic components, peripherals or circuits, cause system instability, freeze, reset, unexpected auto-shutdown, crash or lock-up. Computer manufacturers and designers have took great effort in ensuring that system runs coolly by designing the electronic component to create less heat, and when the heat is unavoidable, using an efficient cooling system and/or fan with improve internal air flow to disperse and remove the unwanted heat and reduce the temperature. For users who want to know exactly how hot is their system, modern computers have built-in sensors that allows user to monitor and read vital statistics on critical system components through BIOS or software applications that interact with the sensors’ API. In addition, there may also be fan control circuits that allow user to control and adjust the fan speed from software level. These sensors, commonly from Analog Devices, Dallas Semiconductor, Maxm, or National Semiconductor, are located on several locations inside the computer, such as on the motherboard, inside the CPU, below the CPU, inside the GPU, inside the hard disk and etc. Some PC vendors or manufacturers provide program tool to read or get data from the hardware sensors. However, there is plenty of alternative software applications, listed below, which enable users to monitor and view motherboard, CPU, GPU, hard disk and other peripherals’ temperature, voltage and/or fan speed. HWMonitor, freeware from CPUID, is a hardware monitoring program that reads PC systems main health sensors : voltages, temperatures, fans speed. The program handles the most common sensor chips, like ITE IT87 series, most Winbond ICs, and others. In addition, it can read modern CPUs on-die core thermal sensors, as well has hard drives temperature via S.M.A.R.T, and video card GPU temperature. Special hardware monitors such as Abit uGuru and Gigabyte ODIN power supplies series are supported too. Download HWMonitor from www.cpuid.com/hwmonitor.php, or directly download HWMonitor 1.15 setup (HWMonitor_115_setup.exe), 32-bit ZIP (HWMonitor_115.zip) and 64-bit ZIP (HWMonitor64_115.zip). PC Wizard is another utility from CPUID designed especially for detection of hardware, but also some more analysis. It’s able to identify a large scale of system components and supports the latest technologies and standards. 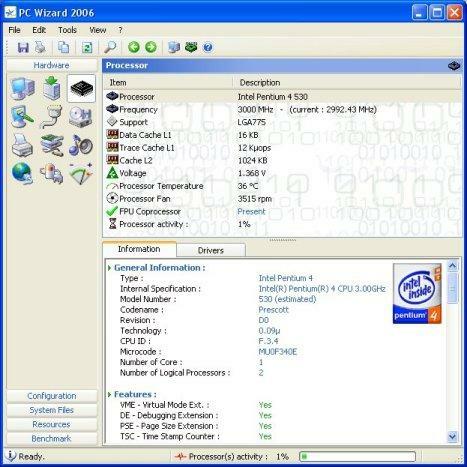 PC Wizard is also an utility designed to analyze and benchmark your computer system. It can analyze and benchmark many kinds of hardware, such as CPU performance, Cache performance, RAM performance, Hard Disk performance, CD/DVD-ROM performance, Removable/FLASH Media performance, Video performance, MP3 compression performance. The reading of temperatures, voltages and fan speeds is buried between many other information though. Core Temp is a compact, no fuss, small footprint program to monitor CPU temperature. 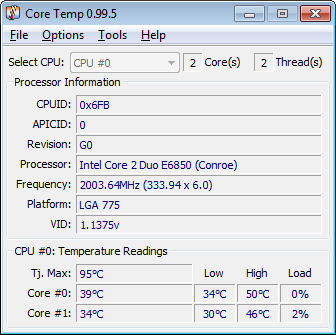 Core Temp supports Windows Vista and Windows 7, both x86 and x64 versions, and can show the temperature of each individual core in each processor in the system, and able to work completely motherboard independent. Hardware Sensors Monitor utilizes sensor chips on smart motherboards to track system and CPU core temperatures, voltages and cooling fans. By quickly catching an overheated computer, you can prevent disasters such as system instability or damage. The program is resource friendly, resides quietly in the system tray, and continually monitors the various parameters. By clicking its icon, you’ll view real time values for each component. Hmonitor supports all Windows OS: Windows 9X,ME,NT,2000,XP,2003,Vista,2008, including X64 editions. 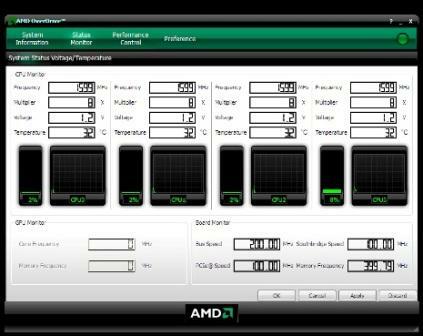 An tool from AMD for AMD processor powered system to let user personalize computing experience with state-of-the-art real-time overclocking. With AMD OverDrive, user can adjust your processor, memory and graphics settings to push the performance envelope and monitor all performance settings including clock memory, voltage and memory timing. Real Temp, from TechPowerUp, is a temperature monitoring program designed for all Intel single Core, Dual Core and Quad Core processors. Each core on these processors has a digital thermal sensor (DTS) that reports temperature data relative to TjMax which is the safe maximum operating core temperature for the CPU. As your CPU heats up, your Distance to TjMax will decrease. If it reaches zero your processor will start to throttle or slow down so maximizing your distance away from TjMax will help your computer run at full speed and more reliably too. Download Real Temp from techpowerup.com. 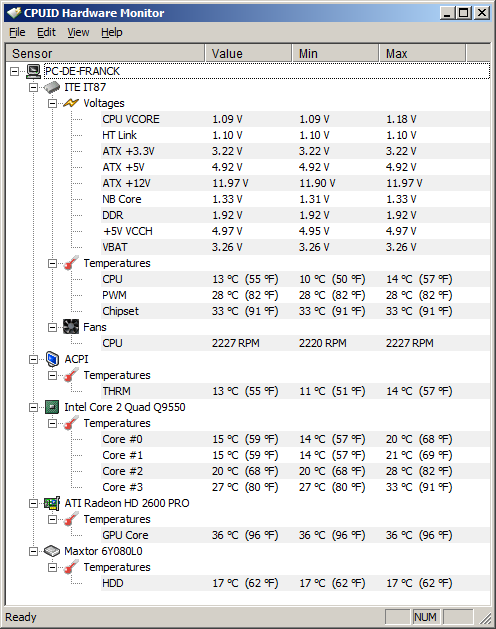 CPU Thermometer is one free CPU temperature monitor; it can help you monitor your computer CPU temperature in live time. Program can start with Windows start-up, and show live CPU temperature in your desktop tray icon. CPU Thermometer will show CPUID, Frequency, Core Number and CPU current temperature. Program provide some useful functions, when the CPU temperature over some value that you set, it can “Show warning message”, “Shutdown computer” or “Reboot computer”, it can protect your PCs. 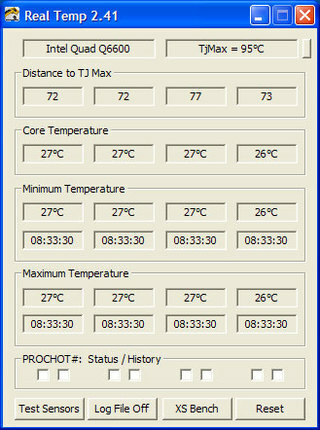 Download CPU Thermometer from cputhermometer.com or directly download the setup installer: cputhermometer_setup.exe. 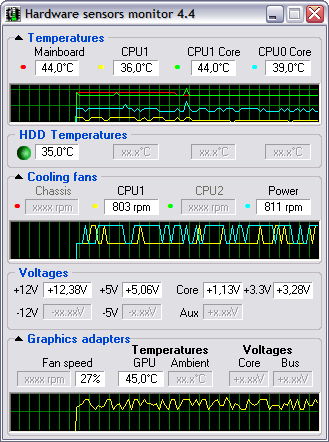 The ASUS PC Probe II 1.x (older version is ASUS PC Probe 2.x) is a simple utility that monitors vital information in the computer such as fan rotations, voltages and temperature. Additionally, it gives system information such as hard disk space, memory usage, CPU type and processor speed. After installation, the application resides in the taskbar and provides audio warning through the PC speakers if certain thresholds such as temperature and voltage have been exceeded. If your system is overclocked, remember to raise the appropriate warning limits or face frequent warning pop-ups. HWiNFO (command line utility) and HWiNFO32 are professional hardware information and diagnostic tools supporting latest components, industry technologies and standards. Both tools are designed to collect and present the maximum amount of information possible about computer’s hardware which makes them suitable for users searching for driver updates, computer manufacturers, system integrators and technical experts as well. Retrieved information is presented in a logical and easily understandable form and can be exported into various types of reports. Download HWiNFO32 from hwinfo.com or directly download HWiNFO32 v3.43-623 setup installer (hw32_343.exe), ZIP (hw32_343.zip) or beta version 3.44-650 (hw32_344_650.zip). 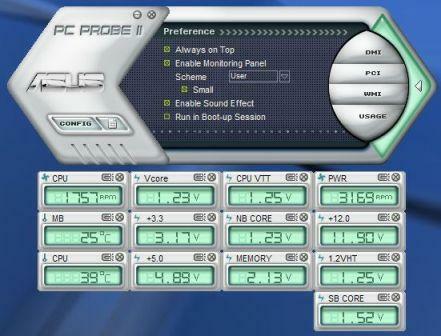 Allows control of fans in Apple computers in Windows and monitoring of temperatures. All Intel Macs supported + any conflicting programs are automatically closed and reopened. 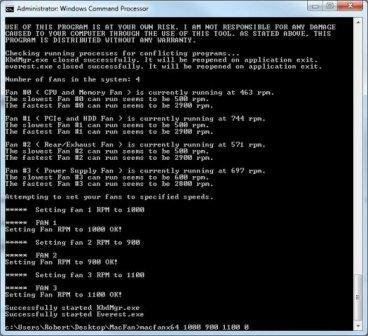 Download Mac/SMC Fan Control for Windows from sourceforge.net/projects/macfan/. For Mac OS X, check out iStat Menus, iStat Pro, iStat Nano, Temperature Monitor, Fan Control and smcFanControl. For Linux, check out lm-sensors, GKrellM (GNU Krell Monitors), KSim, and Conky. For FreeBSD, check out lmmon.